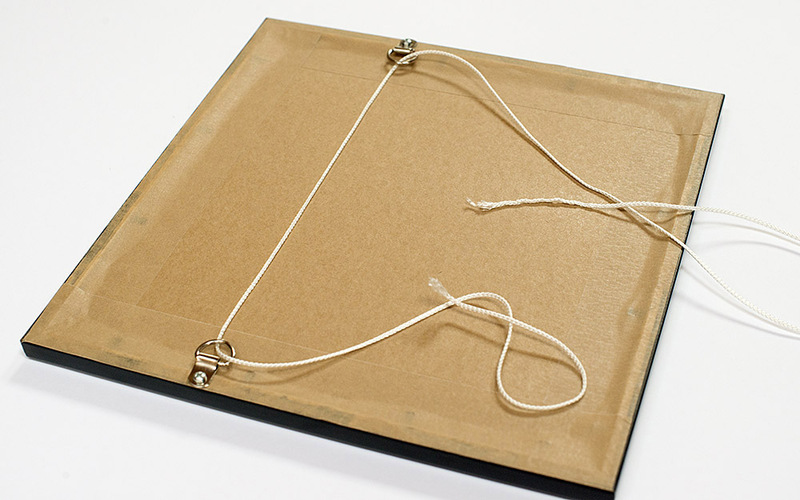 This how to guide shows how you seal and finish the back of a picture or photo frame prior to hanging or selling. The assumption in this article is that you already have a picture frame either custom made or pre-made with glazing, mount and backing board cut to size and attached. 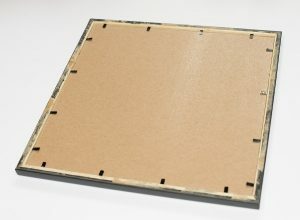 The backing board should also be able to provide some degree of moisture protection eg aqua board or similar. Secure the backing board, mount, artwork, and glazing ‘sandwich’ in to frame rebate with flexi points, semi rigid points or other similar framer’s points and tabs. these can be fired in with a tab gun or manually pushed in. Measure the sides of the frame 1/3 of the way down from top edge, mark with a pencil or bradawl, then create a shallow starting hole in the frame with the bradawl. 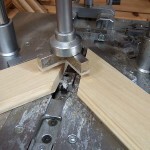 Repeat on other side of frame so you have two matching holes for starting a screw thread on each side of the frame moulding. 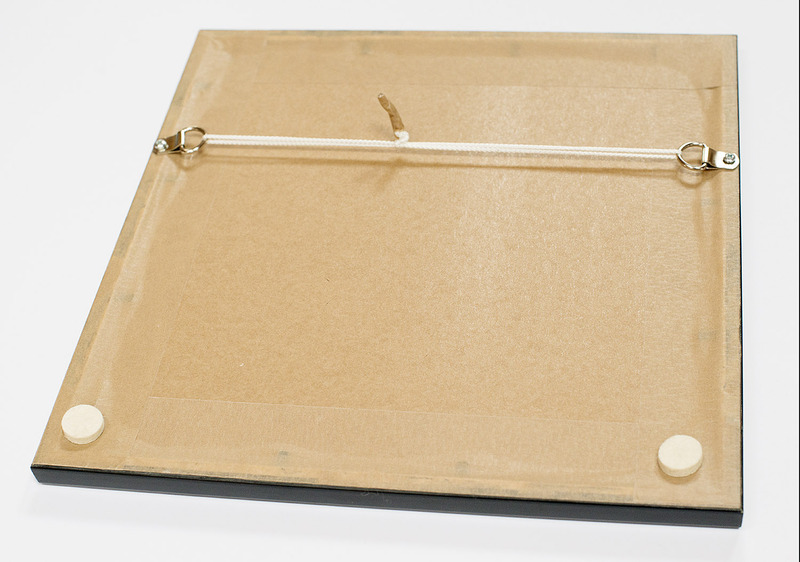 Attach a D-Ring to each side of the frame using a pan headed screw to hole it in place. The frame should now be ready to attach picture cord or wire. Step 5 : Attach cord to each d-ring and secure in place by use of a knot. Preferably one that tightens on itself under tension. 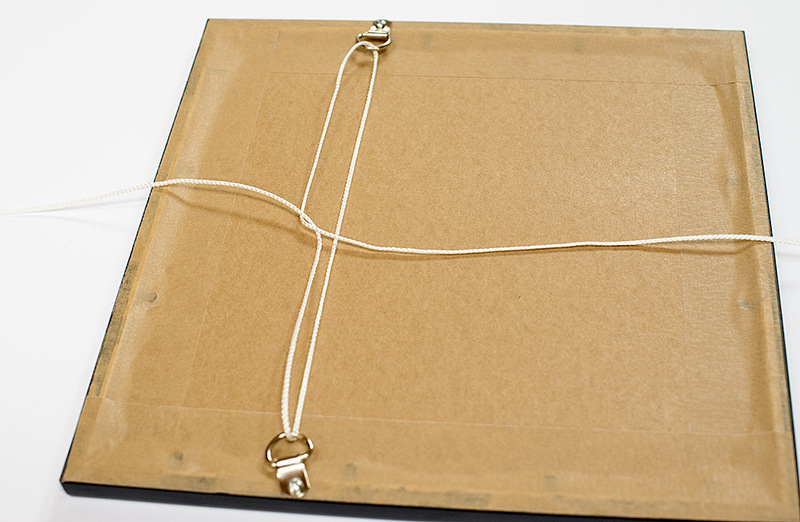 Details of one picture framing knot can be found in this article. Step 6: Attach two felt or other similar bumper pads to each lower corner of the frame. 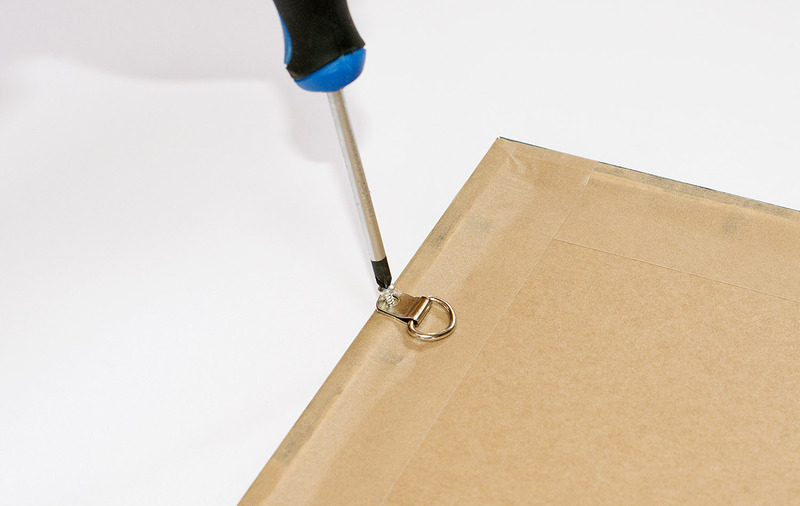 This will help stop the frame moving on the wall as well as help prevent the frame from marking the wall. It will also create an air gap and allow air to circulate behind the frame. 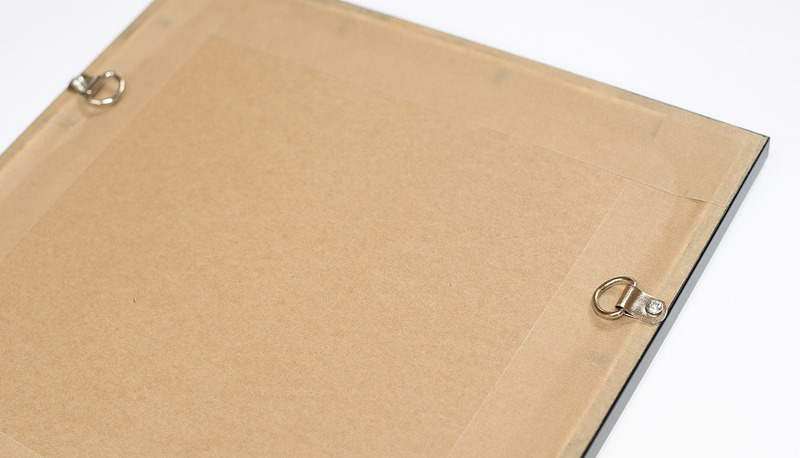 The picture frame backing process is complete and it’s time to hang your picture on the wall! 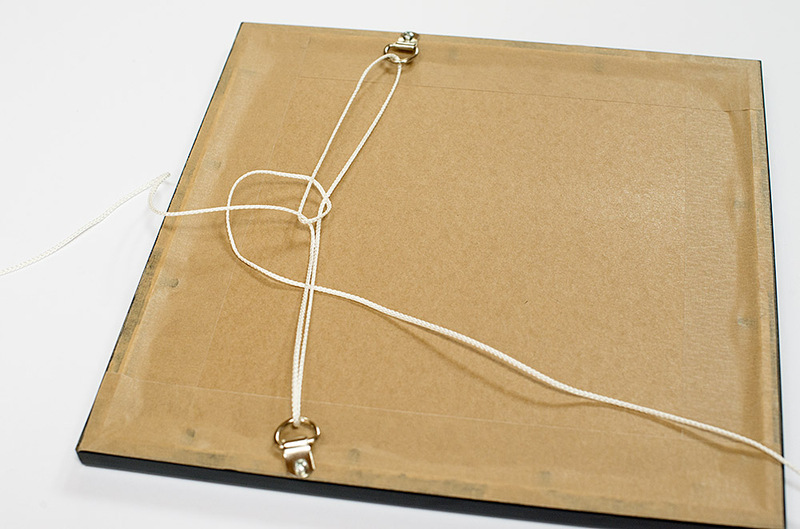 A commonly asked question is what picture cord knot works best for hanging a picture frame? 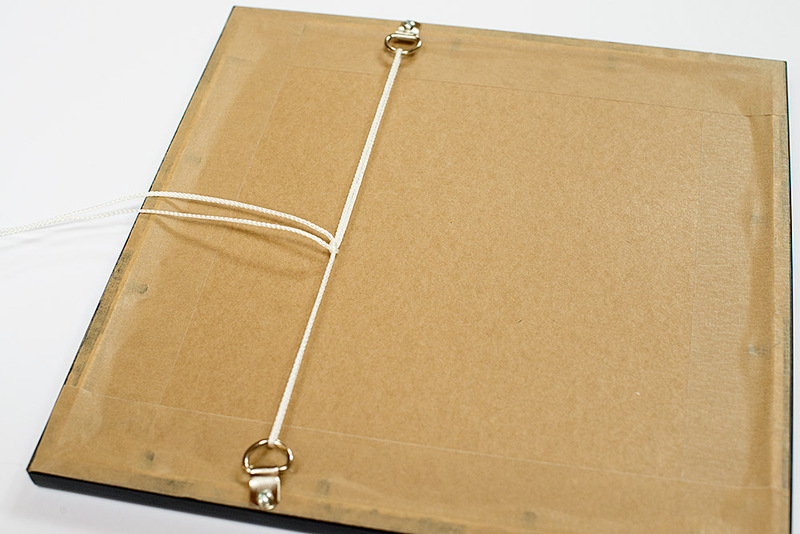 To answer this we first have to ask what are the desirable features of a picture cord knot? Sagging can be minimised by using low stretch picture cord, you can then decide on the choice of knot. 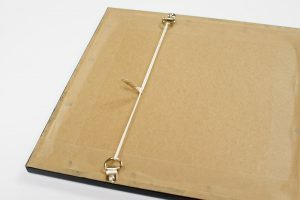 Pictures are most commonly hung using a pair of D-Rings screwed onto the back of the each side of wooden (or plastic) picture frame. They provide attachment point loops that picture cord or wire can be then be strung between. 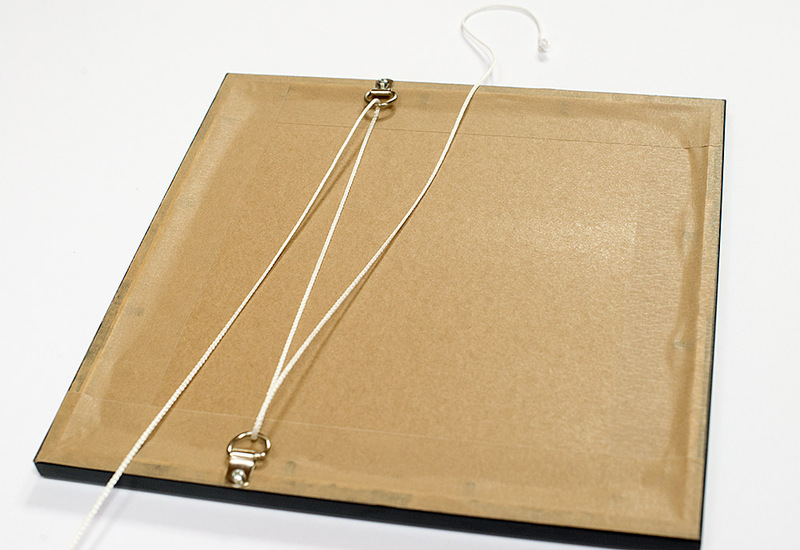 The cord or wire can then be used to hang the frame from a picture hook (nail, screw or similar) that is attached to the wall. 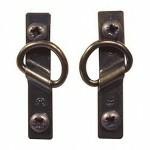 Single hole D-Rings are the most basic form of hardware for this purpose. 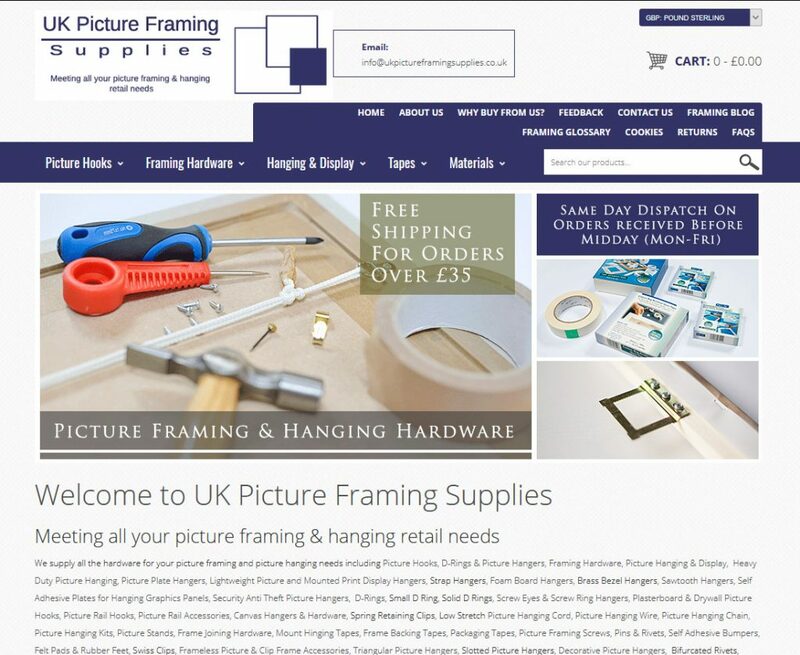 They are useful for most frames up to about 0.5m wide. 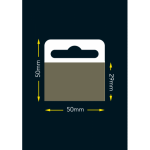 Wider than 0.5m but < 1m or when using a heavier frame/moulding, then double D-Rings are advised, they are more robust than single D-Rings and have two screw holes. Apply frame backing tape around each back edge for the frame/backing board to seal the frame from dust mites and dampness. 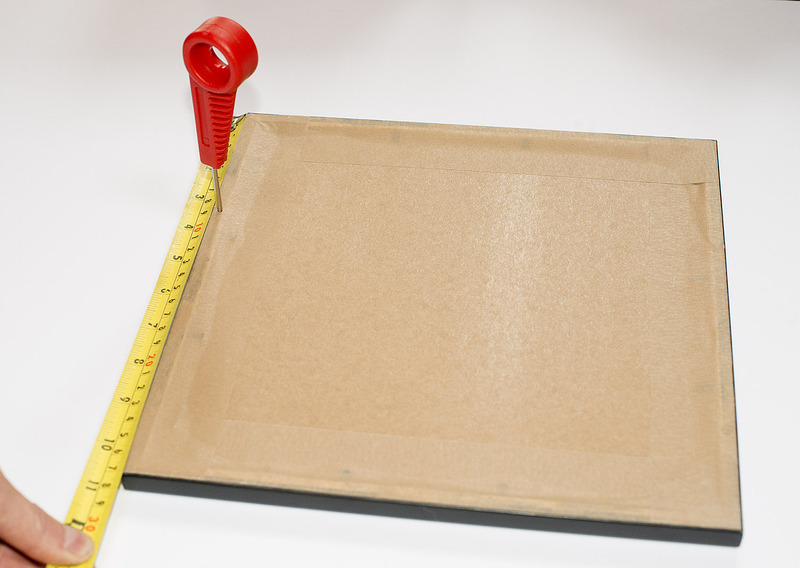 Measure approximately 1/3 of the distance down on one side of the frame and mark with pencil/pen. Measure down the other side the exact same distance and mark again. Use a bradawl to poke a small hole into the frame backing at this mark on each side, this will provide a start for the screws. Line up the D-Rings and screw with the pre started holes and screw the D-rings into place. The D’s (loops) of the D-Rings should be facing each other. 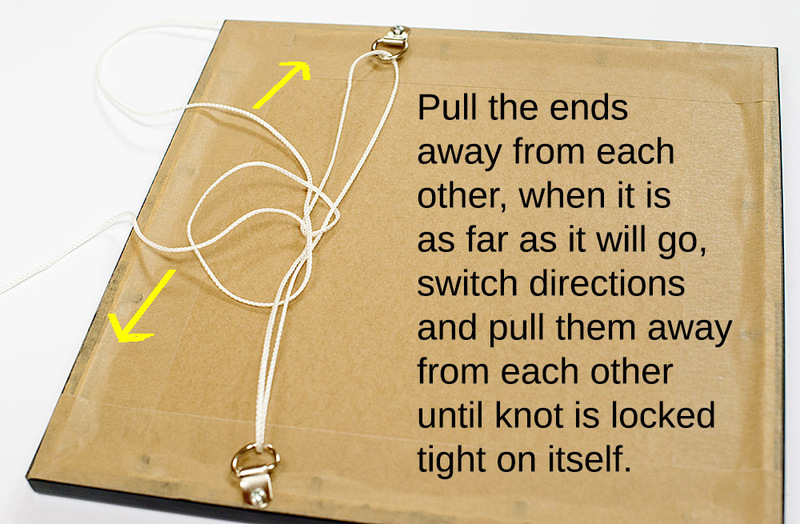 Tie a cord between each D-Ring and secure with a knot. Alternatively, wire and ferrules can be used instead. Finish the cord ends off with a bit of frame backing tape to stop them fraying. You picture is ready to hang on a picture hook. We have pack sizes ranging from 2 to 100 hooks per pack. Ten years on from starting our e-commerce site in 2007 and we find that the way people access the internet has evolved with many (if not the majority) now using mobile devices (smart phones, ipads, tablets etc). We have released a newly redesigned website along with new branding to reflect this change. It has a more modern look, easier navigation and includes both mobile and desktop versions which are designed with user experience on touch screen devices in mind. We hope you like the changes and hope they help with your shopping experience. 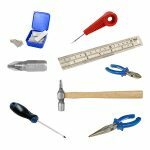 Some workshop hand tools at low prices including steel rulers, tape measures, bradawls, staple guns, screwdrivers, hex keys pliers and more. 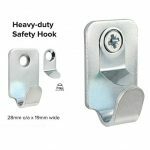 A a heavy duty picture hook that limits quick removal of a frame. 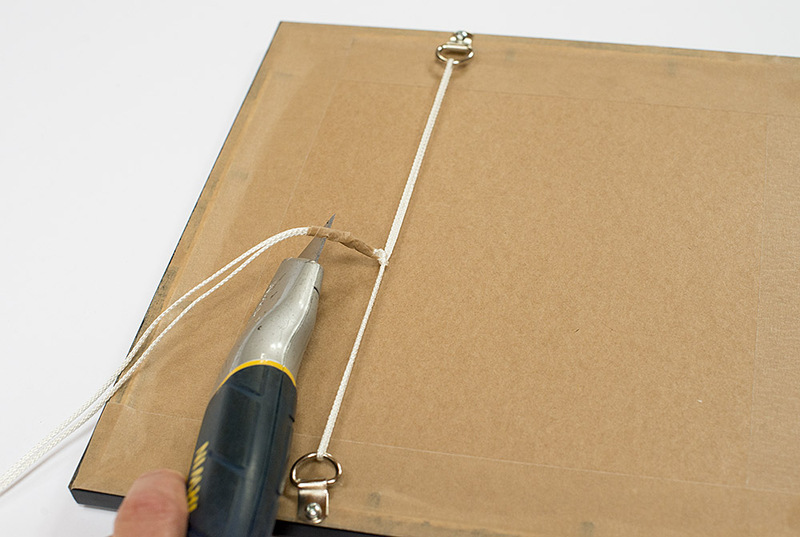 the hook allows the wire or hangers on the picture frame to slide into the hook. The clip then resists removal unless it is lifted and pulled at a certain angle. 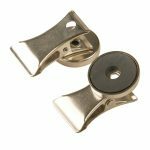 Some magnetic picture hooks, magnetic picture hangers and magnetic self adhesive tape for lightweight hanging applications on metal surfaces. 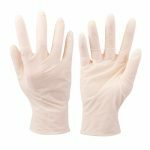 Gloves and Hand protection, including disposable latex gloves and heavier duty gloves for tougher tasks around the workshop. Very useful when handling paint, dyes or inks. 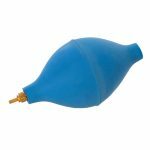 A rubber dust blower/puffer which can greatly help the removal of dust on a picture mount under the glass. Slightly lift the glazing and blow the dust spec away. Some staple guns and staples which can be used for a variety of tasks, but are commonly used to attach a canvas print to a wooden stretching frame. A handy dispenser for parcel tape. 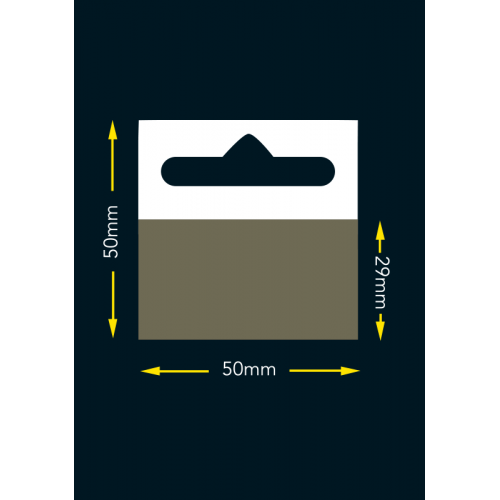 Takes 50mm wide parcel tapes (both clear and brown). The end is always ready to use. As you finish your dispensing stroke a sharp serrated blade cuts the tape. 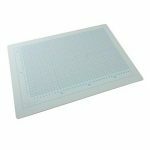 We have a selection of cutting Mats available. The smooth surface allows fine blades to penetrate without blunting. It is ideal when trimming prints. Small cuts almost disappear. Some general purpose workshop clamps. Very useful fro a variety of workshop tasks. 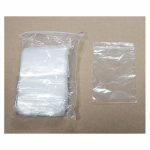 A selection of general purpose poly grip seal bags. 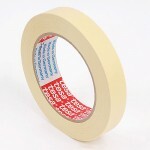 A quality masking tape, which tends to be thicker than most masking products currently used. Cream in colour, with an aggressive white adhesive system. 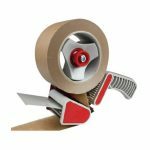 This Masking Tape is ideal for wet painting and spray painting. It is used quite often as temporary tape during the creation of double mounts. Dimensions : 25mm x 50m. 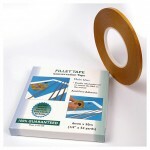 Fillet Tape is a polyester double sided archival tape which acts as an acid barrier between the two surfaces it bonds. This Fillet Tape has a strong acid free adhesive which has very high tack making this a permanent tape which does not yellow over time. 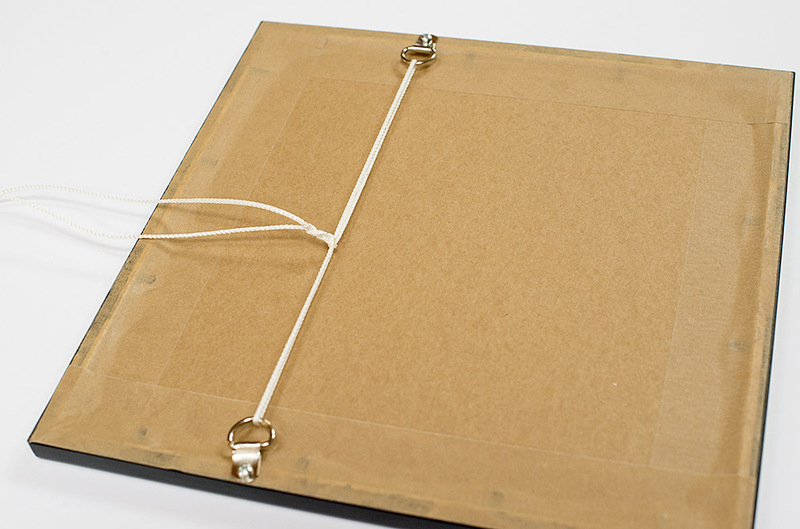 This Archival Tape is designed to attach the fillet or slip to the picture mount in the framing industry. 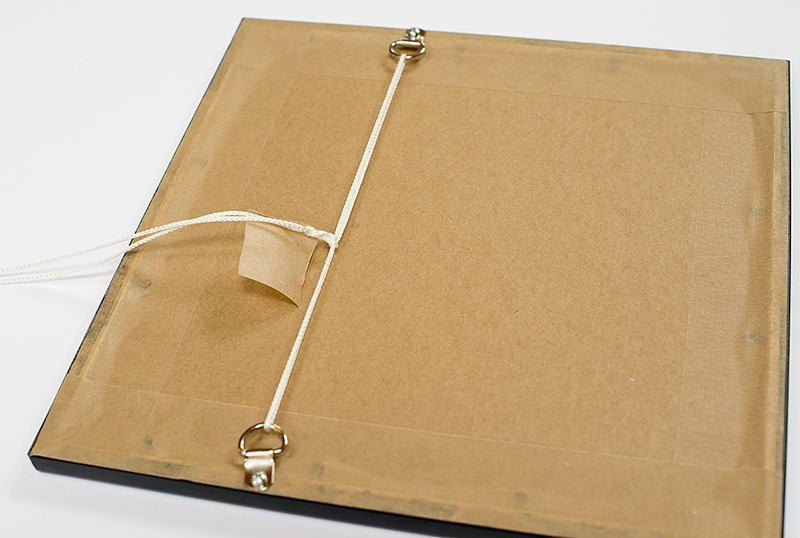 Also works very well attaching and holding slips firmly to a frame. Not compatible with tape guns, but very easy to use. Dimensions : 6mm wide by 50m long. 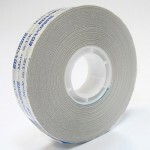 This is a white, gummed, acid free (pH 7 neutral) tape. 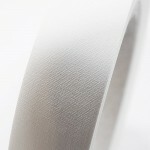 This high quality textured Linen Tape is backed with water activated gum. The high thread count of the linen cloth gives this tape its strength. 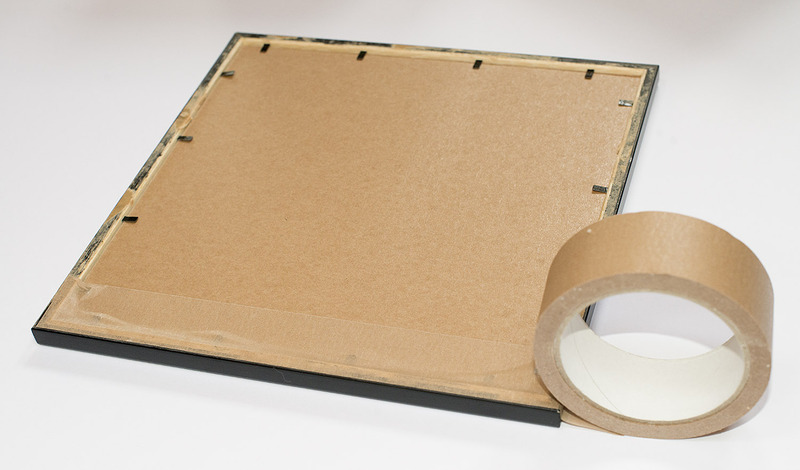 Gummed archival linen hinging tape is mainly used to hinge mounts(mats) to backing boards and is used widely in the framing and art conservation industries. 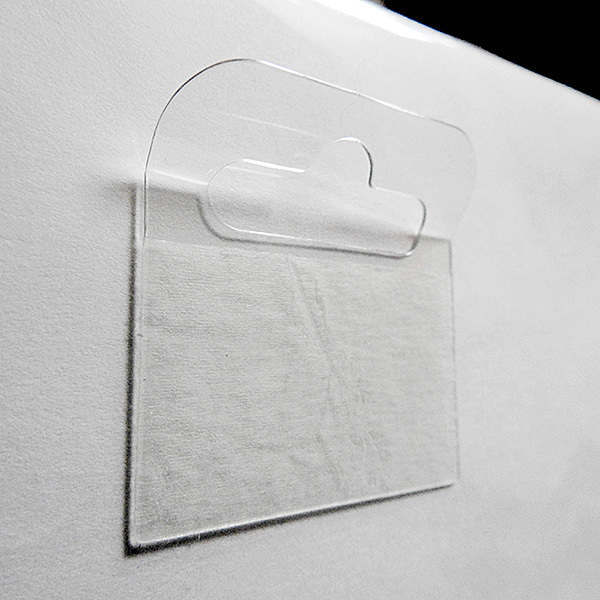 Our Gummed Linen Archival Tape has a pH neutral, starch based adhesive which sets flat and has high tack. Size: 24mm wide, 20metres long. 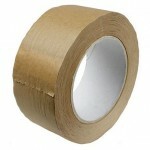 Permanent adhesive, Ph neutral double sided tape 12mm x 30m. 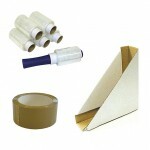 Conservation Ph neutral double sided tape ATG tape gun compatible although a tape gun is not required to use it. 12mm wide by 30m length. 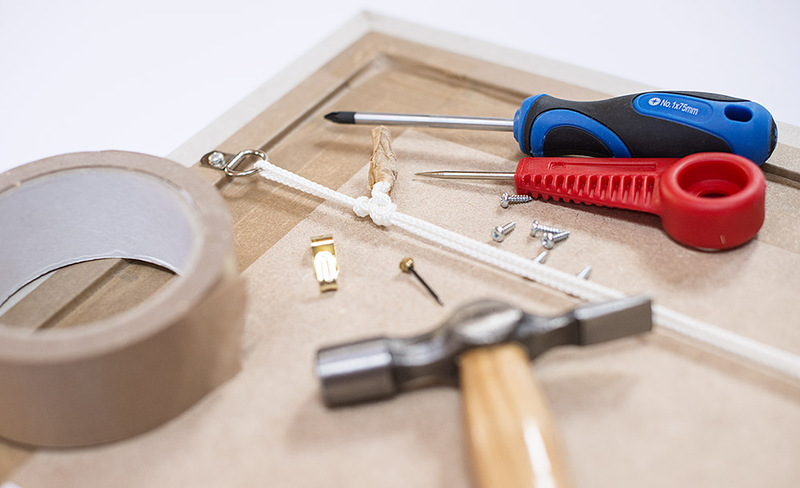 Ph neutral tapes are acid neutral, they use a water based acid neutral acrylic adhesive system which will not react with board or papers and can hence be used for conservation purposes. Will fit most Automatic Tape Guns (ATG) dispensers. Double sided roll of adhesive tape. 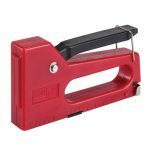 Suitable for ATG tape guns, although a tape gun is not required to use it. Size: 19mm wide by 33m long. Non acid free adhesive. We now stock both 12mm and 19mm versions. A self-adhesive flexible sealing tape is used by many framers. It gives a cost effective yet attractive finish to the back of the frame. The flexibility of the ECO tapes, allow them to be easily shaped over the rebate steps at the back of the frame. 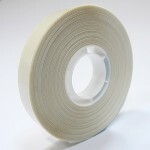 ECO-25 tape is similar to ECO-15 tape in almost every aspect except that it is thicker, stronger, and more opaque, but also a bit more expensive. 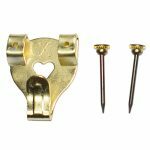 The Angled-D-Ring Hanger (one pair L+R) gives you the security of a two-screw fixing on all types of moulding, including narrow patterns. The D-ring is angled to give the correct alignment of the cord or wire, minimising stress in the frame. 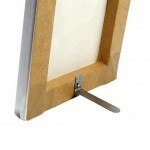 A canvas frame picture stand for small stretched canvases up to around 300 x 300mm (12” x 12”). 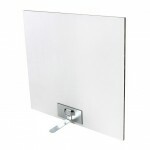 The stand fixes with one screw and is easily bent to make the stretched canvas print stand at any chosen angle. It is designed to fit into the hollow back of the canvas frame. Dimensions: 75mm x 15mm, zinc plated steel. Included with bumpers and screws. 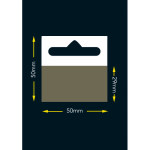 For making small and medium sized flat graphic panels of Aluminium, Acrylic, Di-Bond, Glass, Steel and similar free stand on a surface. 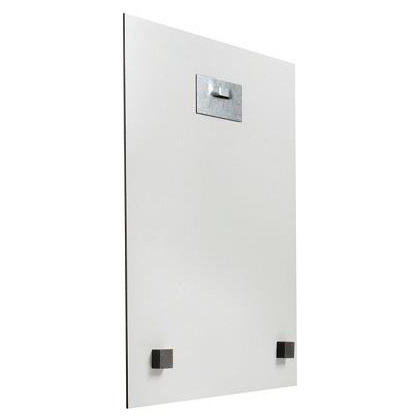 The panel stand clips into the supplied steel self-adhesive base plate stuck onto the back of the panel. The stand is easily bent to fine adjust the standing angle. Dimensions: panel stand 75mm long, base plate is 80x40mm. 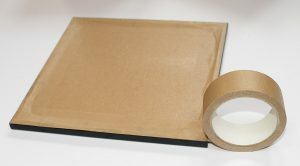 Packaging for picture frames, including handywrap, handy wrap handles, cardboard picture frame corner protectors and packaging tape. Useful for the packaging, protection and transportation of picture frames safely. Also useful for presentation of completed frames when ready to return to customer as it can create a professional touch. 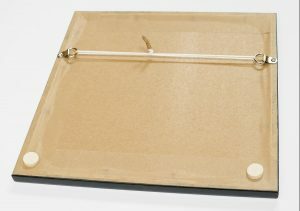 These hangers are suitable for most hanging and displaying most mounted prints. 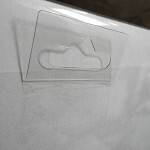 The self adhesive pad stick onto the rear backing of a mounted print, and provides a loop that can be used to hang over a nail, screw, picture hook etc for display purposes. The hangers work well sticking to a cellophane wrap on the backside of the mounted print. We have started to add some new products to our range. 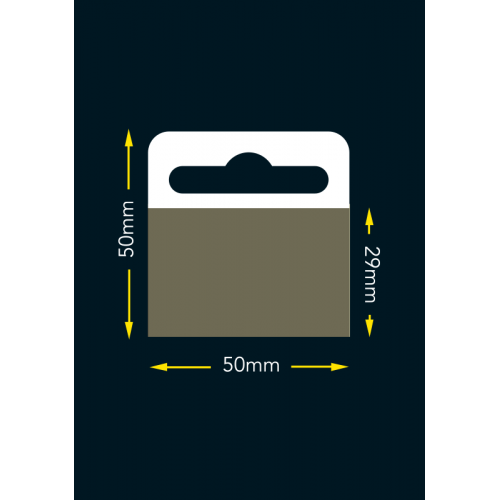 Self adhesive metal plates for hanging graphic panels these come with the option of white or black adhesive, and can hang panels up to 2kg. These hangers usually work beast as a pair. 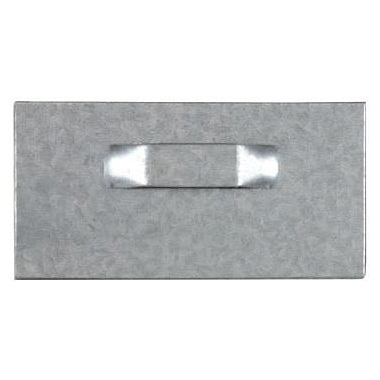 Each hangers comes with 2 foam bumpers to allow the panel to sit parallel to the wall. 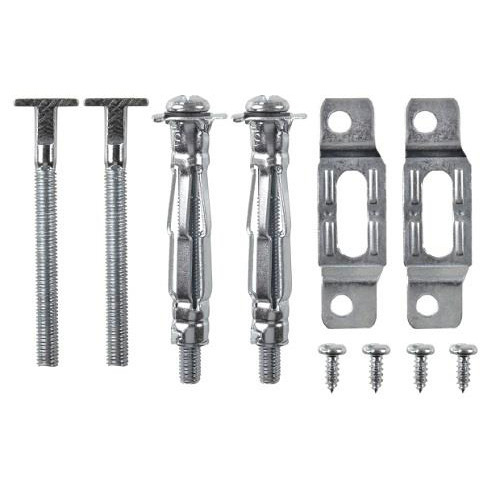 We also now have T-Screw Security hangers for 12mm plasterboard (drywall) and T-Screw Security hangers for 24mm plasterboard (drywall). 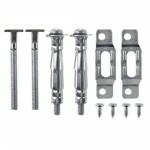 This adds to the already popular standard T-Screw Security Hanging Kits. 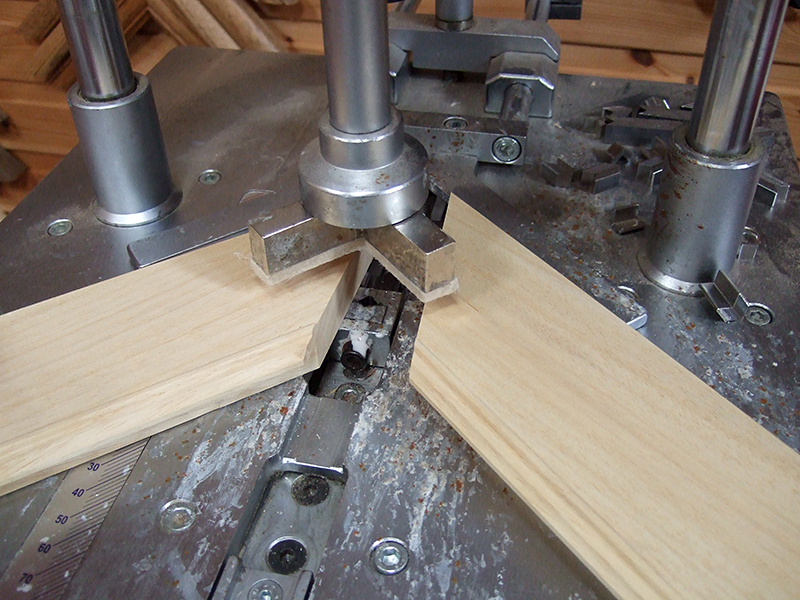 Picture frames require precision cutting to achieve 45° mitred edges. This process is usually achieved by using a guillotine, which leaves perfectly smooth 45° edges. The next step is to accurately join the four equal mitred edges together to form the frame. Traditionally, this used to be done by hammering picture framing pins in from the sides of the frame and was not the most efficient way of creating perfect joins. You sometimes come across very old frames that have been joined this way and, although they have lasted a long time, their corners usually show gaps. Sometimes those gaps can be large as well as dangerous looking! 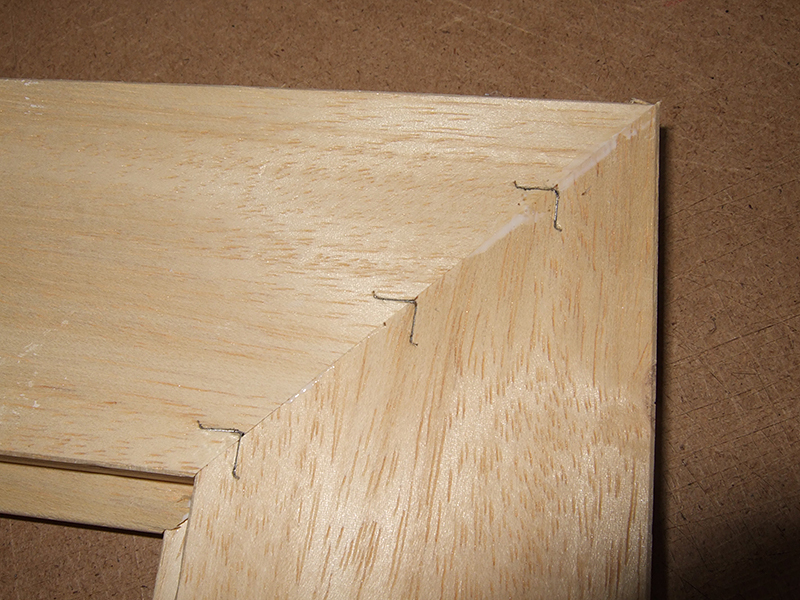 The industry standard method for joining picture frame corners these days is to use V-Nails (“V” shaped nails) to join the 45° corners together. The V-nails have one sharp ‘V’ and one blunt ‘V’ end. 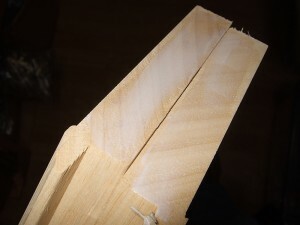 The sharp end gets pushed into the 45° mitre wood corners. They are also designed to pull the joints together when inserted. 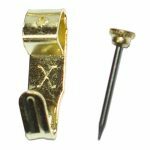 The industry uses underpinners to insert V-nails, and smaller types of over/under pinner are available for the hobby/enthusiast markets which do an equally good job, albeit perhaps at a slower pace. V-nails themselves are made of hardened steel (for hard woods) and softer steel for soft woods. They come in a variety of heights to reflect the wide variety of moulding thicknesses available. They commonly come in 7 mm, 10 mm, 12 mm and 15 mm heights. 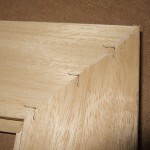 The strength of a picture frame joint comes from two main factors – the choice of V-nail size and also the adhesive that holds the join together. It’s really a combined effect. PVA glue squeezed onto mitred joints of frame. 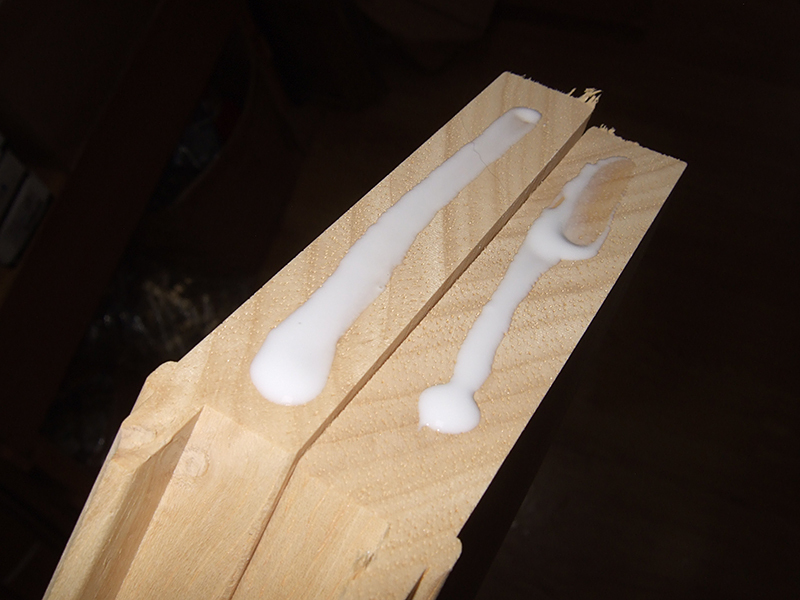 Wooden mouldings use PVA wood adhesive. 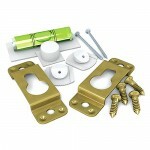 Other types, like plastic mouldings, use other types of adhesive, eg fast bonding super glues. To join a wooden frame moulding, the PVA glue is squeezed on to the mitred faces of wood. If these faces were joined like this, the glue would likely be squeezed up and onto the wooden face which is not desirable. This is especially so if you are using wood stains as the PVA leaves areas which resist wood stain penetration. Smoothed PVA glue spread evenly on the surfaces. 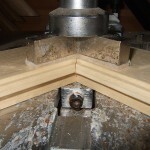 To prevent this, and to create a nicely bonded joint, it is best to spread the glue out smoothly and thinly on each face you are about to join, working the glue into the grain. You should also make sure to wipe any excess glue off before joining. 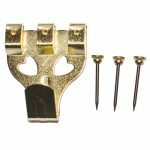 This ensures an optimally glued joint and reduces the possibility of the PVA creeping onto the face of the frame. The mitre joints are now ready for the insertion of V-nails. V-nail size is usually chosen based on the thickness of the moulding being used. A good rule of thumb is to choose a V-nail that goes somewhere between 2/3 and 3/4 of the depth of the moulding being used. If shorter V-nails are used, the joint may fail and start to open. If longer V-nails are used, you may actually punch through the front face of the frame, rendering it useless. It is sometimes possible to use several different V-nail heights on one corner depending on the profile of the moulding. 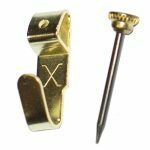 It is also possible with an underpinner to stack V-nails one on top of another, eg 2 x 10 mm V-nails go in to a 20 mm depth. This can provide some uses when you encounter deep rebate mouldings. In this example I am using an Alfamachine minigraf underpinner to do the job. The V-nails are pushed up into the underside of the frame by a hardened steel head that is operated by a foot pedal. The upper cushioned pad descends and presses down firmly from above. Underpinner firing V-nail with felt clamp pushing down from above. This process is repeated around every corner until the frame is completed. 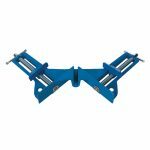 If you don’t have an underpinner, the hand tool pinners/underpinner versions can be used in conjunction with clamps or strap clamps to do the same task. 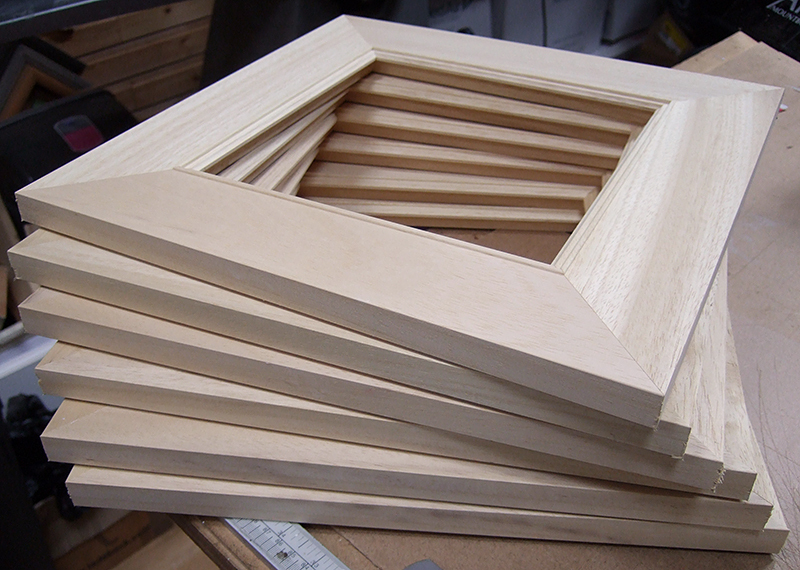 A pile of underpinned, assembled wooden frames can be seen in the first image of this page. 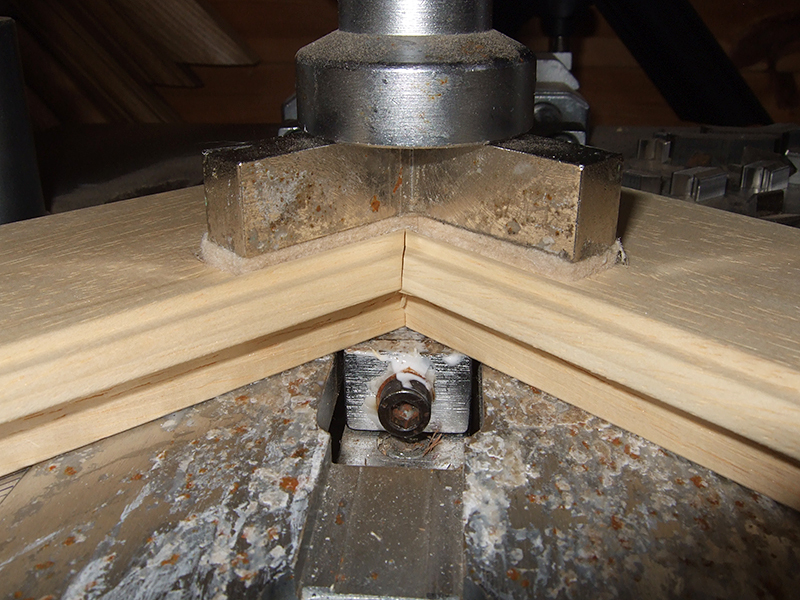 For this particular moulding, I used single 15 mm V-nails at three spacings along the mitre.